Gallstones form when liquid stored in the gallbladder hardens into pieces of stone-like material. The liquid, called bile, is used to help the body digest fats. Bile is made in the liver, then stored in the gallbladder until the body needs to digest fat. At that time, the gallbladder contracts and pushes the bile into a tube-called the common bile duct-that carries it to the small intestine, where it helps with digestion. Bile contains water, cholesterol, fats, bile salts, proteins, and bilirubin. Bile salts break up fat, and bilirubin gives bile and stool a yellowish colour. If the liquid bile contains too much cholesterol, bile salts, or bilirubin, under certain conditions it can harden into stones. The two types of gallstones are cholesterol stones and pigment stones. Cholesterol stones are usually yellow-green and are made primarily of hardened cholesterol. They account for about 80 percent of gallstones. Pigment stones are small, dark stones made of bilirubin. Gallstones can be as small as a grain of sand or as large as a golf ball. The gallbladder can develop just one large stone, hundreds of tiny stones, or almost any combination. Gallstones are one of the most medically important complications of voluntary weight loss, though the relationship of dieting to gallstones has only recently received attention. 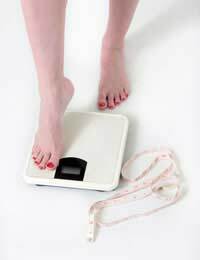 People who lose a lot of weight rapidly are at greater risk for developing gallstones. A recent study found that women who lost from 9 to 22 pounds (over a 2-year period) were 44 percent more likely to develop gallstones than women who did not lose weight. Women who lost more than 22 pounds were almost twice as likely to develop gallstones. Doctors believe that dieting may lead to gallstones because sudden changes in the diet can cause a shift in the balance of bile salts and cholesterol in the gallbladder. The cholesterol level is increased and the amount of bile salts is decreased. Going for long periods without eating - such as skipping breakfast- a common practice among dieters, also may decrease gallbladder contractions. If the gallbladder does not contract often enough to empty out the bile, gallstones may form. Some weight loss methods may be better than others at preventing gallstone formation. Some very-low-calorie diets may not contain enough fat to cause the gallbladder to contract enough to empty its bile. A meal or snack containing approximately 10 grams (one-third of an ounce) of fat is necessary for the gallbladder to contract normally. But no studies have directly linked a diet's nutrient composition to the risk of gallstones. If substantial or rapid weight loss increases the risk of developing gallstones, more gradual weight loss would seem to lessen the risk of getting gallstones. Again, studies are needed to test this theory. Silent gallstones are usually left alone and occasionally disappear on their own. Usually only patients with symptomatic gallstones are treated. The most common treatment for gallstones is surgery to remove the gallbladder. This operation is called a cholecystectomy. In rare cases, drugs are used to dissolve the gallstones. Other non-surgical methods are still considered experimental.